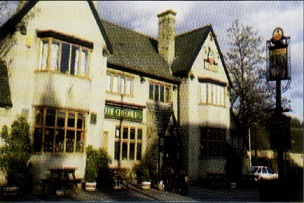 The Alpine public house sits on the outskirts of Greasbrough near Rotherham, where a hooded figure has been seen wandering around the bar area. Also a grey mist was seen one night by one of the bar staff who went to investigate what she thought was an intruder. 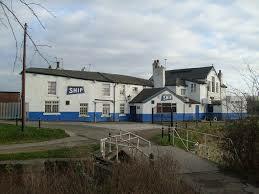 The pub is said to be haunted by a woman named Henrietta who had once live near where the pub had been built. She was unhappy because her Father and brother used to drink and come home drunk and beat her. The pub was later exorcised by a priest after a séance went wrong, when the person conducting it suffered an heart attack. Further comments: The figure a black dog was seen in a small cave area near the stones, the sound of whimpering was heard before the dog manifested itself while snarling its teeth. Scaring the unsuspecting man half to death he closed his eyes and waited his fate, when he opened his eyes the dog had gone! More recently we have received another sighting of this strange spectral figure, please see below for their story in their own words. Took my grand-nephew Michael (not his real name) for a walk in Stones wood, which is not far from where I live. It was a cool October afternoon, and the weather was calm and slightly misty. We walked a way along the top path to the point where it levels out, before deciding to turn back. I walked back along the path while he decided to climb down the rocks (not really allowed). I waited for him under the railway bridge at the bottom of the steps. A few minutes later he came belting down the steps in a blind panic. "What's the matter with you? ", I asked. "You'd run if you'd just seen what I've seen", was the reply. When he got his breath back (though still looking back and in a hurry to get away from the area), he described seeing something big, black ("black as darkness", he said), and moving through the undergrowth as if it wasn't even there. Some kind of huge animal, somewhat like a panther only much bigger, but of indistinct shape. He didn't hang around to get a better look. Seems our Michael had just had an encounter with the fabled Stones Wood Padfoot, and he was genuinely terrified. I've been in these woods dozens of times, and never come across anything supernatural, except once hearing a strange growling sound down by the brook, which I would describe as a 'growling wind' (for want of a better term), even though there was no wind at the time. 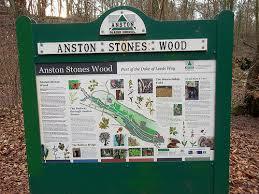 Anston Stones is visible as a belt of trees from the A57 between Sheffield and Worksop, and has an unusual history, which is described in detail in a later chapter. The following story was related by Newcastle man Alec Fox, who was spending a short holiday with a friend in North Anston, in the summer of 1993. The weather was fine and warm, and the friends had decided to go for a walk in the stones. They had reached one of the many rocky outcrops about half a mile into the expanse of green belt land, when Mr Fox decided to go on ahead and climb to the top of a small crag. As he was walking in between two columns of rock, he felt curiously uneasy, as though he was being watched. Undeterred, he found a foothold and began to climb the rock face. He reached the top and was Astonished to see a huge black dog, something like a rottweiler but much larger (in fact Mr Fox noted that it was the largest dog he had ever seen), approximately ten feet away from him. The dog stood motionless and stared, growling. Mr Fox remembers feeling as though he was not witnessing an "earthly" event, and described a sudden chill coming over him. Although not an unrational person, he climbed back down the face as quickly as he could and called out to his friend who was standing below. She had seen and heard nothing, and quickly ran round the crag and up to the area in which Mr Fox had been surprised by the black dog. There was nothing there; no trace of a dog, or a person who could have been walking such an animal. Mr Fox followed, and noted that there was nowhere in this part of land for the dog to have disappeared so quickly without trace. He remembers remaining chilled until the pair retraced their route and left the scene, whereupon the temperature appeared to return to normal. Although the most rational explanation would be that the large black hound was not a phantom at all, and could easily have been a domestic dog enjoying a walk with or without its owner, Mr Fox remains unconvinced. 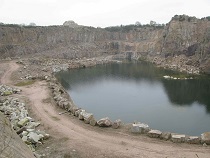 He described his encounter as having had the feeling of a "once in a lifetime experience", and has refused to return to this area of Anston Stones on his subsequent visits to South Yorkshire. Interestingly, another feature of the phantom hound is its association with guardianship of sacred places. Perhaps on that summer afternoon in 1993, the walkers were being warned away from a particular area. It would be interesting to find out whether any other visitors to this spot have had the same experience. The former rectory, now known as High Trees, is haunted by the ghost of a rector who caught his wife in the arms of the butler and murdered her. There is an indelible bloodstain on the floor where the deed was done. I am curious about ghost but not really a believer but I had an experience about 16 years ago where I saw a ghost I am very sceptical when people go on about orbs and I see pictures of ghosts I think they are all false lighting or faults on cameras but i know what I saw we were driving down Back Lane at Ravenfield heading towards Doncaster Road at the bottom just has you come to the dip in the road there is a graveyard (cliched I know ) but something went across the road very fast not on the ground and I can only describe it as looking like a piece of black voile had been blown across by a sudden gust of wind, although there was no wind I have never told anyone this story except for my husband who drove me to the graveyard in daylight just a year ago out of curiosity I never felt anything except a bit of unease at the thought that I could have seen one of the people buried there. I refuse to go there at night, as I say I am sceptical of sightings but I know what I saw and it has stuck with me ever since I have looked on the internet to see if anyone else has ever reported sightings here but I cannot find any which makes me seem like it was just me after all I would appreciate it if you know of any sightings from this place if you could let me know this has been on my mind for several years. I have just read the story from Julie Milnes who posted her thought in regards to a strange object which was seen on the back lane from Ravenfield. Firstly i would just like to say, you aren’t the only one. 7 Years ago when my boyfriend first pasted his test and we were at the relationship stage of not sitting in the house we always used to park on the same hill in the car at night and talk and just have our own space before he would drop me back of at home... anyway to the point. We were sat in the car talking with the engine and lights off and all of a sudden we both saw the most strange shape of a black cloth come from the left hand side of the field right across in front of the car and vanished, I myself have always thought until I see it then I’ll believe it but I can now honestly say that I know exactly how this lady feels. I’ve never said anything to anyone about it till a few years ago and people laughed at us, but we both knew what we saw that night and we never went back up there again, my granddad recently passed away and was then buried in this graveyard.. I have to go up now to visit my granddad but always go the other way down the hill and go back the same way so that I don’t have to drive past where we saw the strange ghostly activity. 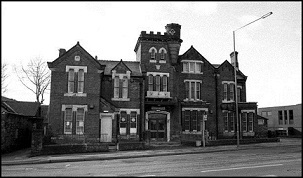 The Bluecoats staff have reported the sound of a child crying which they beleive dates back to when the building was a school, also sounds of footsteps are heard on many occasion throughout the building along with cold spots. This reported sighting was left on Rotherham-ghosts guest book, where figures from another era are seen on a regular basis. I did conduct an investigation down here and I must admit there were some pretty strange things happening, unfortunately I didn't see any apparitions but will be going back. Storey submitted by G.Y location unknown. The figure of a woman dressed in a brown dress and bonnet has been seen walking through the pub quite regularly by the staff normally around closing time. Also staff and the cellar workers have reported that there are strange happenings down the cellar and an uneasy feeling of being watched and also catching fleeting movements out of the corner of their eye. They believe this to be the presence of a little girl. In the late 1970's, the Rotherham Advertiser ran a column for local people who had had supernatural experiences, inviting them to come forward and tell their tales. 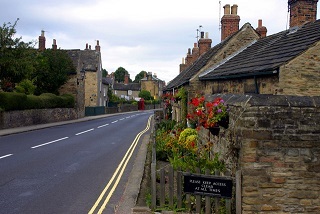 One elderly Rotherham resident, Mrs Nettleship, recounted an episode which concerned her family, and had taken place in a house on Clifton Lane, Rotherham, in the mid-1930's. The Nettleships had two young children, baby Roy and four-year-old Audrey, and their circumstances meant that the whole family were forced share the same bedroom. A fortnight after moving into their new home, the little girl began to grow fretful when left in the bedroom alone, and insisted that a 'white lady who shook her hands and cried' was appearing as she lay in bed. Putting this down to the vivid imagination of a child, the Nettleships reassured Audrey that nobody could get into the bedroom, and assumed she had been dreaming. Several months later, Mrs Nettleship discovered an old-fashioned doll in a cardboard box in the bedroom, which had previously lain hidden on a high shelf. As the family was poor, she decided to keep the find a secret and repair the doll as a Christmas present for Audrey. She returned the doll to its box and replaced it on the shelf. It was shortly after this discovery that, at around 9.30 pm one evening, the Nettleships were in the living room when they were startled to hear screaming coming from the bedroom. They ran in to find Audrey in a state of shock, such that her mother later described her as 'rigid with terror'. Mrs Nettleship noticed that Audrey's nightdress was torn, and took the little girl downstairs to comfort her. Audrey described how the 'white lady' had tried to 'take her away, and she had had to fight to pull away from her. Although the Nettleships could see for themselves that their daughter was in a terrible state, they dismissed the story as a vivid nightmare. However, as time progressed, Audrey became more and more subdued, stopped eating and eventually became ill.
Mrs Nettleship took her to the children’s' clinic, and the doctor informed her that somebody or something was obviously frightening the little girl very badly for her to be in such a state of terror. The Nettleships once again put this down to the 'nightmares' which they assumed Audrey had been having, since their baby son Roy (who slept in a cot next to her) had never once been disturbed in the night. Shortly afterwards, the family decided to move house, but before they left, Mrs Nettleship went to look for the old doll she had found some months previously in the bedroom. The box was exactly where it had always been, but the doll had vanished. Nobody else admitted to having even seen it, and in its position on the high shelf it would have been very difficult for Audrey herself to have removed it. Although the happenings on Clifton Lane were never quite forgotten, the family continued with their new life in a different area of Rotherham and soon the memories faded into the past. Then, many years later, an article in the Rotiierham Advertiser caught Mrs Nettleship's eye. In a piece about local ghosts, The White Lady of Clifton Hall was mentioned. As she cast her mind back to the old house on Clifton Lane, where Audrey had experienced such discomfort as a child, Mrs Nettleship was horrified to read that the self-same White Lady is said to appear wringing her hands in distress as she cries for her lost children... and began to believe for the first time that perhaps somebody - or something - could have indeed tried to take her small daughter away. The Corner Pocket at Wath Upon Dearne was once a cinema, at the top of the club, right at the back is where the projectionist worked, many people have reported a sighting of a shadowy figure which is said to be of that of an usher who once worked there and has since died. He loved the job so much he keeps coming back. 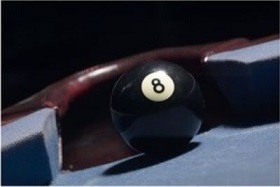 Also, when people have been playing snooker on the top tables the temperature will suddenly drop, and the figure is seen to cross from one of the toilets to the other. Dinnington's 95-year-old Lyric Theatre is though to be haunted by one of its past stage acts. Strange happenings have led to rumors that The historic theatre—famous for variety stars such as Ken Dodd and Danny La Rue. Such things as cold chills, lights flashing without being turned on or connected, objects rolling uphill—and photographs of orbs have all been witnessed here. During pit holidays, one of the deputies would go down into the workings on his own to check the coal faces and make sure that they were all in order. Several years ago, one such man had gone to look at a particular district and sat down to have his lunch break before continuing work. A light appeared in the distance, getting brighter as it came towards him, until a man appeared clearly with his head-lamp on. The deputy did not recognize his face but said, "hello" to the stranger, who replied a greeting, then passed him and carried on his way further down the tunnel, towards a disused district. The light from his head-lamp finally disappeared into the distance. At the end of the shift, the deputy came out and asked his colleague on the surface who else was working on that particular district, so that he would recognize the man in future. But there had been nobody else down the mine at all on that shift. Doug Evason, overman at Dinnington colliery until 1985, heard the phantom miner mentioned on many occasions, but never witnessed anything unusual himself. 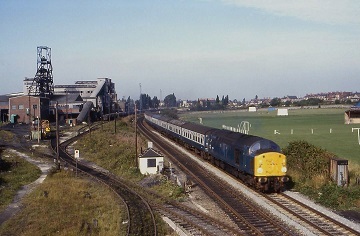 The fact remains that many people have died underground at Dinnington in accidents of one kind or another. Because the shaft was sunk in the early 20th century, safety standards were not as stringent as they are today, and accidents were commonplace. Who is to say that one of these poor miners does not still walk through the tunnels"
Another restless spirit said to walk at Dinnington colliery was a man who appeared above ground, rather than below. At night, there was a huge light set up to illuminate the colliery buildings for the men who came above ground in the dark. On several occasions, the large shadow of a man was seen looming against one of the building walls, as though there was someone standing in front of the lamp itself ... And yet there was never anybody there. Eric Brotherton, an ex-collier born in Dinnington in 1919, has a history of spectral visitations occurring around the deaths of his family or friends. In the old days of Dinnington colliery Mr Brotherton was a member of the rope splicing team. Out of the ten men in the team, he is today the only one left alive. Two years ago, his closest friend and co-worker, Joe Phelps, appeared to him one night as he lay awake in bed, unable to sleep. Mr Phelps "walked into the bedroom" where he was immediately recognized, but in surprise Mr Brotherton could not understand why his friend had arrived at such a strange time. Mr Phelps seemed to want to rouse him from his bed, and shouted, "come on, hurry up; we're going to be late!" Before walking out through the door. Two days later, Mr Brotherton, who had found no connection as to why an image of his friend should have spoken to him in the small hours, found out that Joe Phelps had died on the very night that he appeared by his bed. Sightings of the recently dead are quite common among family members and friends of the deceased. What makes this story interesting is that it was perhaps with a wry sense of humour that Joe Phelps called Eric Brotherton with words he hadn't used for over thirty years. When they worked together as young men on the rope splicing team, Joe quite often roused Eric with a shout of: "Come on, hurry up--we're going to be late!" 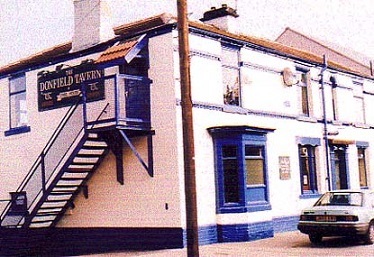 In the early 1980's, David and Cathy Wayland, tenants of the Don Field Tavern on Eldon Road, Eastwood, were plagued by the spirit of an ex-landlady who had allegedly died on the premises many years before. The ghostly woman appeared to Mrs. Wayland one evening dressed in white. 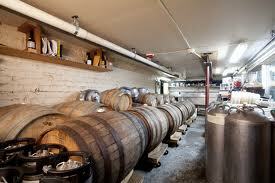 She was in her sixties, with dark hair and dark skin, and expressed a desire to stay within the building. It is said that a former member of the Kent family committed suicide by hanging herself from the banister, this is still in use today. She was angry with her father as he forbid her from seeing the local bakers son who she had fallen madly in love with. Its said that her restless soul still walk the corridors of this ancient establishment. Many other sightings have been seen here including children. 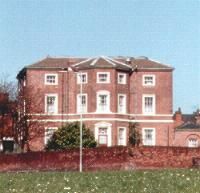 Ferham House is situated in Kimberworth, Rotherham. It was built in 1787 by John Platt of Rotherham. It became the home of the Habershon family in the 1880s and has been used for a number of purposes which include a single mothers refuge and a work house. The home has since received grade II listed building status. A report was made to Rotherham-ghosts that strange happenings had been taking place quite recently, which included doors and windows banging, furniture moving and voices heard when no-one was there. The most recent event happened to one of the staff members working there, she was walking down one of the corridors and was about to enter a room when she saw a tall man wondering around, she didn't think too much of it until she checked the visitors book and found that no men had been visiting the building at the time she saw him. A group of people were driving down Garden Lane at Ravenfield, as the road began to dip a figure of a man immerged dressed in 80s clothing and a cream jacket and fuzzy hair, the man just walked across the road and disappeared not giving any eye contact to the group. The group have since traveled this road a number of times and seen the man on many occasions recreate the same movements. 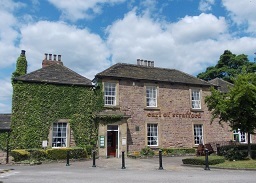 The 17th century former manor house in the village of Wentworth, Rotherham has seen many things go bump in the night have included ghostly footsteps in the beer cellar, a clock striking in a sealed up room in the attic, a white faced woman customer reporting seeing a woman in Victorian dress in the toilets, and objects moving around the pub. 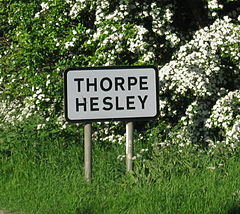 Hesley woods at Thorpe Hesley is also know to be haunted, there have been many sightings there where some lads were camping out near the bridge when they saw a figure wearing a black cloak walking deeper in to the woods. Many other sightings also include strange shapes appearing and then disappearing, along with light formations and unexplained footsteps and noises. The Story: This picture was taken after reading a report on the internet one evening about paranormal activities taking place at Hoober Stand, Wentworth, Rotherham. Armed with a digital camera I decided to visit the site at about 2200 hours on the 6 December 2003, upon arrival nothing seemed out of the ordinary, it was a dark cold night but the sky’s were clear, I set about taking photos randomly at the folly and surrounding areas. I left the site about 45 minutes later. Upon getting home I downloaded the pictures which I had taken and to my amazement, I found that it looked as though I had captured an image of a figure in the window of the building. I can confirm that no-one was in the building or that any lights were on inside either. I did go back the following evening to take another picture in the same location and at the same time, but as I suspected the figure was no longer there. I have visited the area since on several occasions and have yet to find anything else that is paranormal, but I will still keep going! You never know! 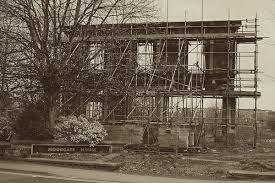 The mid-1960's saw the demolition of a beautiful historic house which had for 340 years stood in the Canklow Meadows area of Rotherham. 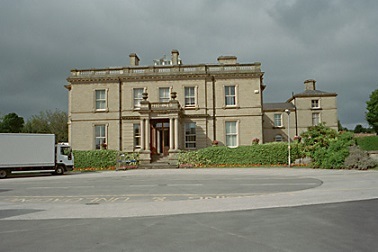 Haworth Hall, seat of the Haworth family for several generations, had a haunted reputation which lives on to this day in the memories of all those who knew it. In Elizabethan times, daughter of the house Elaine Haworth was brutally murdered by her jealous suitor Sir Herbert Vayne, who was then tried and sent to his death at York City gallows for the crime. After her death, residents of the Hall spanning several generations told of heavy footsteps and the rustle of long gowns echoing from many of the old, dark rooms which existed on the second floor of the building. 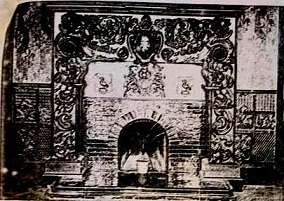 At the beginning of the 18th century, one of the house's occupants discovered a secret room behind one of the large fireplaces in the dining room. It was fully furnished, including a large bed on which the curious investigator was horrified to find a skeleton... believed to be that of William Haworth, the brother of murdered Elaine. The story of his death remains a mystery; the location of the secret room must only have been known to a select few at the time of his disappearance - until his body was stumbled across by accident, many years later. There is a strange echo here of the much better-known story of Minster Lovell Hall, in Oxfordshire, where Francis Lovell is reputed to have fled for safety after the battle of Stoke, secreting himself in a hidden room whose whereabouts was known only to an aged and trusty servant. The retainer unfortunately died that very night, leaving Lovell to perish of starvation, only being rediscovered in 1708 when workmen making alterations broke unexpectedly into the room, seeing a skeleton in rags, seated at a table over an open book, all of which, rags, books, skeleton, and table, faded to dust with the inrush of air, before their very eyes. The two stories are so similar, perhaps they are both versions of an earlier, now lost, occurrence? I would like to add Hellaby Hall to your site. I have fond but eerie memories as a child with my schoolfriends exploring inside this historical house. I was mortified when I heard that it was to be restored into a hotel of all things. Although I cannot recall any sightings, I remember our bottle of lemonade falling suddenly off a shelf which scared us so much we ran all the way home to Wickersley. The atmosphere in that place could be cut with a knife. The rotten fusty charred smell, the darkness, the silence and the echo’s. Some rooms felt happy, others so terrifying your legs would shake uncontrollably. Although The memories of that old house will be with me for ever, I would give anything to go back, as it was then. Screaming Mary and the pigs. The Story: Mary the landlord’s wife was jealous of her husband’s prized pigs because he spent more time with them than he did with her. One day Mary decided to kill the pigs to get her husbands attention, upon finding out what Mary had done he drowned her in the local river. 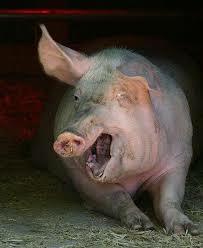 It is said that Mary and the pigs can be heard screaming around the street of Kilnhurst. Further Comments: the ghosts known as Jasper has been heard walking around the area, the friendly ghostly monk can also be heard whistling, as if trying to attract attention to himself. In the 1980's a pump fitter was called in to repair a breakage during one afternoon shift. There were few men underground as it was the weekend, so the miner traveled to the broken pump, about three miles from the bottom of a shaft, alone. He had been gone for some time when he astounded colleagues by appearing dazed and out of breath at the bottom of the shaft once more, having run the three mile distance from where his repair was taking place. The miner was in deep shock, and could not utter a word for more than twenty minutes. Despite the pleas of his colleagues, he could not speak about what he had seen, but something had terrified him so badly that he refused ever after to return to the district in which he had been working. 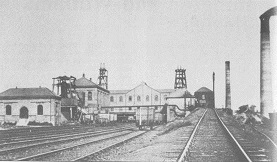 In a subsequent conversation with the older colliers who had been at Kiveton for many years, miner George Smith discovered that this area had once been the site of a fatal disaster. Although this could be a possible explanation for the supernatural sighting, Mr Smith's colleague still refuses to talk about the incident. To this day, nobody else has any idea exactly what he saw. The sighting of a ghostly horse and carrage was seen heading from the Gallows Public house towards Thurcroft one day before disapearing into the road where the train line runs. Records show that before the train line was built, the road was at a lower level. Could the old horse and carrage be travelling along the old road? The second sighting was seen by a man and his son in the early 70s, they were travelling down Laughton Common Road towards The Gallows Public House, however, they were stopped in their tracks by a figure of a man stood in the road. The driver kept flashing his headlights at the figure, but it refused to move. Then, just had he had appeared, the figure vanished right before their very eyes. Both the dad and son said that the figure was dressed in some form of red clothing and was carrying some form of rope. Could this have been the Hangman Himself? 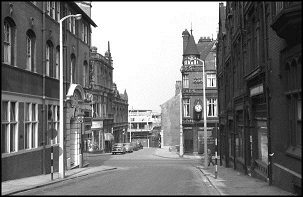 The old Yorkshire Bank on High Street, which was built on the sight of the former public house The Crown, and is now known as the The Litten Tree, has a ghost! A website visitor Denise Venn, used to work there but had never seen it, but she did sense that there was something there. However, the cleaners did report seeing an apparition of a man wearing a tall hat on a number of occasions as he walked upstairs and then disappeared over Moorgate Street. Denise owns a painting of the old pub dated back to the1800s and claims the clothes they wore then, fit the description of this man the cleaners saw. A Drunken Miner in Maltby fell in a quarry near a local mine. In September 2005 two lads walking by there came across a semi naked man drinking from a cider bottle who warned the pair to be careful. The figure entered a nearby shaft and vanished. One of the witnesses later found out that a former miner with a drinking problem was found dead in the area, his body was discovered in the slurry pit. Moorgate Road is one of Rotherham town centre's oldest roads, and contains a number of fine old buildings which were converted into business properties in the second half of this century. Refuge House is one such building, and staff who work here have noted many strange happenings over a period of several years. In the early 1990's, salesman Paul Smith was with a colleague in a main office at around 1.00 am in the morning, preparing to finish work after a long shift. Before their eyes a stack of papers rose into the air and began to whirl around as though being blown by a freak draught, in a circular motion. They continued to circle for around fifteen seconds before eventually fluttering to the floor. On another occasion, two employees were preparing to lock up, having ensured that everybody else had left the building, when they were stopped by a pitiful female voice shouting to them from upstairs: 'Don't leave me! Don't lock me in!' The upper floor of Refuge House was once used as servants' quarters when it was still a residential building, and staff have frequently heard footsteps crossing the floor, and doors opening and closing when nobody is actually present on that floor. Oakwood Hall, in Rotherham, was believed to be one of the grandest houses erected in the city in Victorian times. Businessman James Yates was an iron and steel baron, born in Masborough in 1798. Having owned a number of large Rotherham properties as his business expanded, it was in 1856 that Yates decided to build his own... and purchased the local Lawtons Farm, beginning the construction of Oakwood Hall on the land immediately. Before the Hall was finished, a fire broke out and gutted certain rooms of the incomplete building. Yates had to wait longer than he had anticipated to move in, but by 1859 the Hall was repaired and complete. He lived there for just over twenty years before his death. Yates' son had died in tragic barge accident many years earlier, although his daughter Elizabeth was eventually to inherit Oakwood Hall, and resided there with her husband for several years. 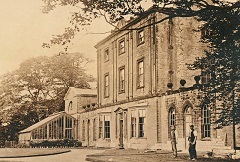 Oakwood was sold in the 1890's, and remained a family home until 1916 when work began to convert it into a Rehabilitation Centre for injured ex-servicemen. During this period it was again damaged by a sudden outbreak of fire, and closed soon afterwards... to be converted yet again, this time into a TB sanatorium. 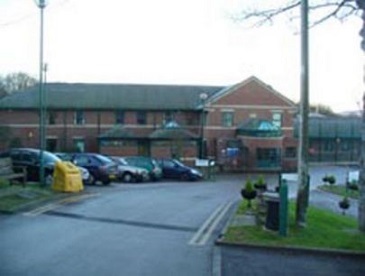 Today it is still used by the Health Service, as part of Rotherham District General Hospital. The history of the building has been so varied that most people are not aware of its many uses throughout this century. In the late 1970's, a local security guard was on his rounds one night when he saw a gentleman making his way towards him along one of the corridors. Concerned that security regulations were being breached, the guard approached the gentleman, and clearly saw his World War I uniform... before he vanished into thin air. The security guard ran away in terror and never returned to his post. Indeed, until several years after the incident, he had no idea that Oakwood Hall had once been used as a soldiers' Rehabilitation Centre. Location: Greasborough Road between Rotherham and Neither Haugh. The Story: This phantom old woman steps out in front of incoming cars, hitting the bonnet and convincing the driver that they have hit a living person, until the area is searched by Police, who find nothing! This has happened on a number of occasions to various people, but still the identification of the woman remains a mystery! It is said that sometimes late at night you can here strange noises coming from the vault on Cemetery Road in Wath and on some nights you can see or hear Dickey Payne on his horse. The Mausoleum in Newhill Park known locally as the vault, it is thought to house the bodies of the Payne family. The vault is what’s left of the once large building Newhill Hall that was built around 1775. After the last of the Payne family died about 1920 squatters moved in and trashed the place. Richard (Dickey) Payne the man who built the house, was so angry that his beautiful house was ruined he mounted his favorite stallion and rode about the hall to frighten the squatters away. Rawmarsh Comprehensive School, was undergoing refurbish work when worker reported sighting of a stooped man, about 5ft 6in tall and dressed in a suit, which apparently walked through a wall. The School is built next to an old grave yard in Rawmarsh and rumors are said that the school could be built on an old burial site. The Story: This hooded spook has been seen slowly moving around the ruins of this once proud abbey. He glides with grace along the ground in and out of what used to be the rooms of the Abbey. The site is also home to a wishing well. Roche Abbey, in the district of Maltby, Rotherham, was founded in 1147 by a Cistercian brotherhood who had traveled down from Newminster Abbey at Northumberland. Although they arrived in the valley in 1140, for several years they lived without a proper dwelling until the local lords offered to build them an abbey. "roche" means "rock", and popular folklore has it that a vision of the crucifix appeared on a certain rock close by and inspired the monks to settle here. The abbey was originally known as the abbey of Santa Maria de Rupe. Although it has been said that no dead were ever buried at Roche Abbey (and that instead they were carried to Blythe Priory to be interred) Les Halford, employed in the abbey house, explained that this is not strictly true. There is a small number of graves belonging to local landowners who bequeathed money to the abbey in their lifetime, on the condition that, after their deaths, the monks would pray for their souls. Around 1534, Henry VIII ordered an investigation into all monasteries in England prior to their dissolution. The abbey was visited by the feared doctors Leigh and Layton, who had the task of presenting a "black book" of their findings to the king. 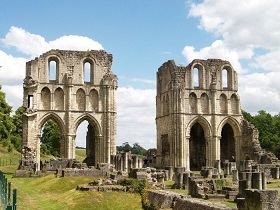 Although Roche Abbey escaped closure at first, being found to be financially viable, on their second visit in 1537, Leigh and Layton reported that "two-thirds of all monks in England were drunkards and so bad as to defy description" and the abbey was closed. According to all surviving documentation, there was no massacre at the abbey; the monks were pensioned off peaceably but still tried frantically to hide their pewter chalices in the woods, while the local people took hymn books and pews to repair their carts and wagons! It was also said in the report by Leigh and Layton that the monks worshipped a nearby rock on which there was an image of the crucifix. Perhaps this recalls the legend of why the site for Roche Abbey was selected in the first place. If such a rock still survives, it must be deeply buried in the woodland which surrounds the ruins. Indeed, there are many ancient yew trees whose age must number hundreds of years in the surrounding grounds. Yews are often associated with worship groves of the pre-Christian religion; it is not hard to imagine that the area around Roche Abbey has been sacred for longer than there has been a Christian monastery standing. 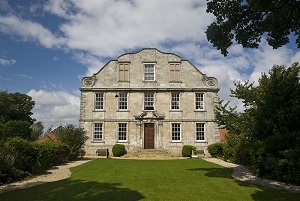 The Abbey House is only 240 years old, although it appears much older. It was originally built as a hunting and gaming lodge for the well-to-do. Many local people have taken stones in the past from the ruined abbey to build their houses, and it is possible that much of the stone used to build the Abbey House is from the abbey itself. According to Mr Halford, there are stories from local people who have walked around the abbey at dusk, and seen the specter of a grey lady standing at one of the windows, staring out onto the grounds. The sound of a wailing child is said to be heard coming from one of the upper rooms, although on investigation the crying stops and the room is empty. Certain guests are also said to have seen the ghost of a maid disappearing up a flight of stairs. Legend has it that in the 18th century, a maidservant had found herself pregnant, and shortly after her child was born, she killed the baby before hanging herself in the attic. On new year's morning in 1991, four local people reported seeing the specter of a figure clad in white robes, heading across the grass behind the gatehouse towards them. The Cistercian order who founded the monastery did indeed wear white robes all year round, having no change of clothes or extra garments throughout the seasons. The face of the specter was not visible, and it appeared to be gliding at a great speed in their direction, glowing with an unearthly greyish light. The area of grass it walked over was once the site of the wooden buildings which temporarily housed the monks and their abbey guests, until the stone structure was built. Later that same year, at about nine o'clock at night, the same group of friends were waiting in the small car park below the steep crags which surround one side of the valley. Noises so strange and unearthly were emanating from the trees above them that they became afraid to get out of the car, despite having walked around the grounds many times before at later hours than this. The source of the noises proved impossible to locate, and the group left in fear. Indeed, the atmosphere around the abbey is reputed to change from day to day: sometimes it is peaceful and calm, and at others, so menacing that it defies those who wish to enter. Towards the far end of the abbey itself, there lies a small stone coffin without a lid. Local legend has it that if one is to stare for long enough at the head of the coffin, then a face will appear, although nobody is sure of its origins. Why the coffin was never used remains a mystery. Old monasteries and historic houses are often associated with secret underground tunnels and "priest holes", places in which to conceal the people who lived within. In times of religious uncertainty, when popes and abbots often opposed each other and the affairs of god were entangled with the affairs of state, the enclosed order was not always a safe one. Even before the church was split into the opposing factions of catholic and protestant, many preachers were arrested and accused of heresy for their beliefs. A quick escape route was felt to be the safest policy, and Roche Abbey was no exception to this. There is a network of underground tunnels beneath the abbey, leading to houses and castles of consequence. Some of the tunnels run for miles, and have only been blocked for safety reasons within the last few years. In 1980 A dark insubstantial figure was blamed when the landlord moved his family out. Glasses would also break without reason, and doors would lock and unlock themselves. 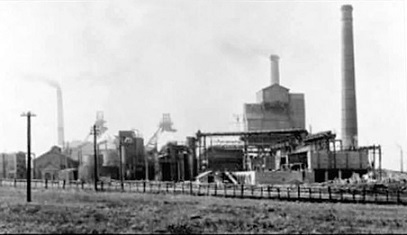 In the early 1980's, a young miner working at Silverwood colliery had an inexplicable encounter with the paranormal. His story consequently became very well known, and aroused the interest of several researchers into the paranormal, as well as being reported in a number of daily papers, including the "Morning Telegraph" and the "Sun". The miner was working underground with two colleagues, who were 300 yards ahead of him. Without warning, a light appeared in the tunnel between himself and the others. As it seemed to be the head-lamp of another miner, the collier waited for his approach. He noticed that the figure wore an old-style square pit helmet and a grubby waistcoat and shirt. As the stranger got closer, his head bowed and the head-lamp lit up the young miner's face. He stared in terror at what he saw. The figure of the man was normal in every respect, except for his face. The lamplight revealed a clearly defined neck and the shape of a face, but where the features should have been, such as eyes, nose and mouth, there was nothing ... Only a blank space. The terrified miner dropped his equipment and ran screaming towards his colleagues. He was taken above ground suffering from shock. He swore that if he was not given a job on the pit surface, then he would gladly resign as he could never go underground again, such was the terror struck into him. Consequently, the young man took a considerable drop in wages to remain safely on the pit surface. The picture was taken late on November 29th, 2002, a Health and Safety Officer, Site Manager and I.T. Manager went armed with a digital camera to record how the renovation was getting on, taking some pictures for a before and after brochure. None of the men saw anything unusual when the picture was taken, and nothing strange appeared on the viewing screen of the camera, however, when the I.T. manager loaded the image on to the computer, this is what the picture looked like. When the renovations on the building were being done, many bones were found and work had to be stopped while investigations took place. 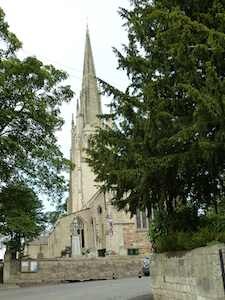 The building is located in the church yard area of All Saints Church in Rotherham town centre. 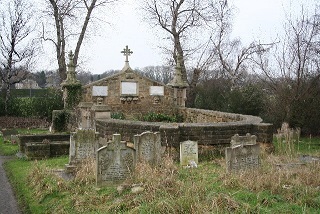 Many buildings have been built on this area, making the graveyard smaller and smaller over the years, including the nearby All Saint’s Building. 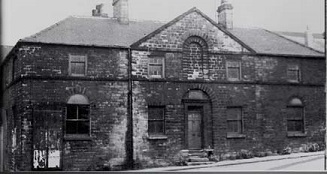 Pre 1842 -The building was The Old Vicarage to All Saint’s Church. 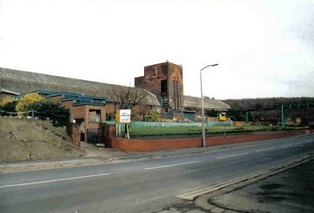 Completed 2005 - Now called The Old Vicarage (All Saints Centre). Further Comments: Two men were attacked in the cellar by an unknown presence, one requiring several stitches to a head wound. Phantom voices have also been heard on the telephone, and footsteps have been heard echoing around. 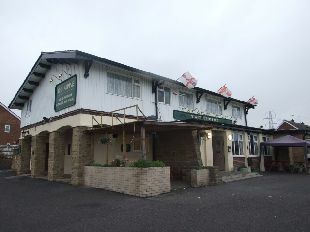 Ghosts in this pub have been seen, standing in doorways and on occasions have thrown glasses from the bar at unsuspecting staff and customers, It is believed it could be one of the pub's earliest landladies, Fanny Knowles.The pub is believed to be one of the oldest in the Dearne Valley, dating back to the 18th century. 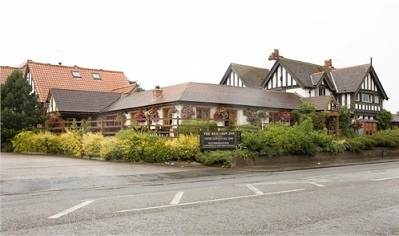 It is believed Mrs Knowles was in charge of the pub when the old building was knocked down and the current building was being constructed on the same site prior to the First World War. Local historians say Mrs Knowles was the licensee for a number of years, but they have been unable to trace any more details about her life. Maybe Mrs Knowles can't understand where her pub has gone. 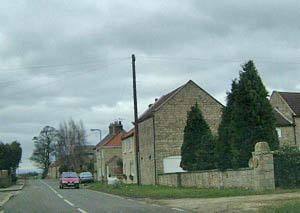 Todwick Crossroads is a notorious accident black spot, which has claimed many lives over recent years, how ever strange sightings have been witnessed by many who say that have seen a horseman ride past them near the garden centre late at night. During the late 19th century conditions in asylums were poor. The patients were treated brutally, by having what was considered to be ground braking experiments conducted upon them. However this made their conditions much worse. 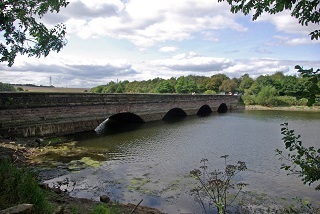 A ghost is alleged to haunt the bridge at Ulley reservoir of a psychopath who escaped from a local lunatic asylum in the early 1900s. He apparently killed himself by falling from the bridge into the reservoir and drowning, the spirit of him is said to be seen running around the roads and paths right up until this day. Further Comments: When this was a general hospital, it was believed that a Roman Soldier would appear at night and inspect every new admission as they slept. In the 1970's, miners at Wath Main colliery were plagued by a phantom miner who struck such terror into them that they would only work underground in groups. 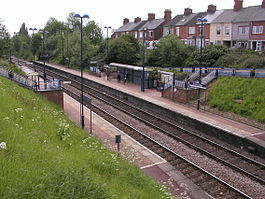 Several newspaper reporters investigated the story, which subsequently appeared in papers such as the "Star", the "Telegraph", and the "South Yorkshire Times". Events began when a small group of miners were moving supplies, and seeing a pit light approach, stopped work for safety reasons. They waited for the man to show himself but his light disappeared. Alarmed, several of them walked down the tunnel to see where he had gone to, but there was no route past them in either direction, and there was no trace of the phantom light. On investigation, equipment at this particular point in the tunnel seemed to have been tampered with. Two more similar sightings followed, and on both occasions equipment was found to have been moved. Two years previously, a miner had collapsed and died of a heart attack in this particular part of the workings, which fuelled the colliers' fear. The ghostly encounters certainly convinced several disbelievers that a supernatural presence existed, although there were others who had still seen nothing and chose not to believe their colleagues! In the late 1960s, Asley Scully was a keen racing cyclist. He cycled fifty miles every day with a group of friends from Wentworth, Rotherham. One particularly cold and foggy February night, Mr Scully had finished his training and left his friends to make the journey home. 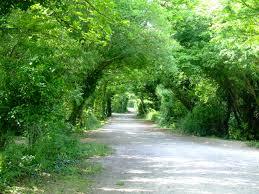 He began to cycle along the lanes at a good pace, hurrying since he did not want to be out any longer than necessary. 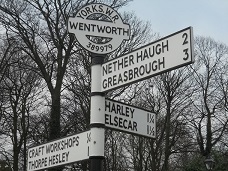 Mr Scully had reached a dark unlit lane between Greasborough and Wentworth, when he looked to the left of his bicycle and saw a large black dog, similar to a labrador but bigger, running along beside him. Despite the cold there was no steam off the animal's breath in the air, even though his own was visible. Neither was there any sound of panting; in fact the only sound seemed to be the dog's feet, which splashed as though it was running through water. Mr Scully felt the hairs on his neck rise, and put on an enormous spurt of speed to outrun the animal. The gradient of the hill was quite steep at this point, but as a racing cyclist, Mr Scully had no problem in picking up speed. He was horrified to look down at the dog and notice that although it did not even appear to have lengthened its stride, it was still keeping up with him. For a further 200 yards the dog continued to run alongside the bicycle, until without warning, it darted through Mr Scully's front wheel and away into an adjoining field. Despite describing the experience to other people who have traveled the same road, Mr Scully has never encountered anyone else who has seen the phantom padfoot. Even today, when he is driving along this route towards Greasborough, it causes a familiar cold shiver to run down his spine! In 1947, a young Rotherham musician named Trevor Beever was a regular visitor to the old Church at Whiston, whose pipe organ he used on a regular basis. Mr Beever had been given a key to the building so that he could enter and leave at will, enabling him to practice during the evening when services were not in progress. One such winter evening, Mr Beever unlocked the church as normal and began to practice alone. Most of the church was in darkness, as he was in the habit of only using necessary lighting over the organ itself. When he heard the sound of footsteps moving along the centre of the church on the stone floor, Mr Beever turned to see who had entered the building... and saw no one. Puzzled, he left his seat and walked towards the small room which was at this time used to house the choristers' garments and other materials. He heard the door click as it opened and closed, although he could still see nobody. Warily, Mr Beever followed the mysterious footsteps into the small room, which was in darkness. He called out, but received no reply, and suddenly became aware of a strange chill enveloping him. Despite admitting to being slightly skeptical in nature, he left the church as quickly as he could and swore never to practice there again alone on dark winter evenings!